1.3. To provide a suitable means of competition between the affiliated clubs. 1. The United Hospitals Boat Club is the organising committee for the various closed competitions based at the University of London Boathouse. These events are private matches as defined in British Rowing Rules of Racing, and sanctioned by the TRRC. There may be invitational crews, usually from local clubs within the Thames central subdivision (5). 2. The British Rowing Rules of Racing will apply as far as is practicable to the competitions organised by the United Hospitals. 3. The United Hospitals will comply with the British Rowing Safeguarding and Protecting Adults at Risk Policy. 4. The United Hospitals will comply with the provisions of the Safeguarding & Protecting Children Policy and Anti-Bullying Policy. 5. In general individual affiliated competitors in the various closed competitions organised by the United Hospitals will be aged 17 years and 3 months at the beginning of the academic year, as the standard minimum age for admission to the University of London and Imperial College. Any individual affiliated competitor who is aged under 18 at the beginning of the academic year will be deemed to have the capacity of an adult for the purposes of the United Hospitals Boat Club, and no specific safeguarding The United Hospitals may accept entries from clubs who are not affiliated members where the competitors are aged less than 18 years, but only where there is an appropriate individual nominated by the competing club available to deal with the welfare and safeguarding issues for each crew which has competitors aged less than 18 years. 6. Whilst the United Hospitals is functioning as the organising committee for the various closed competitions, individual competitors are representing their own clubs. 7.5. ensuring that incidents are reported via the British Rowing reporting system. 8. Whilst the United Hospitals is acting as the organising committee for these events, the club relies on each competing club to assure the safety of the competing club members and other river users. 9. The United Hospitals Boat Club prepares a safety plan for each event which is sent for approval by the Thames Regional Safety Advisor and the Port of London Authority. Each safety plan will have a detailed risk assessment for each event. The summary of key risks is shown in appendix 1. 10. The United Hospitals needs to maintain adequate third party insurance to cover any acts taken by the club as organisers of the events and any reasonable action taken by club officers or officials on or off the water in relation to these events. Individual competing clubs need to maintain their own third party cover during these events to deal with issues not covered by the United Hospitals (e.g. injury or damage due to a failure to keep an adequate lookout). 11. The club will rely on various officials to run these events in a safe and fair manner in accordance with the British Rowing Rules of Racing (in so far as these can be applied to the closed events). It is strongly recommended that all such officials have suitable personal insurance cover. This is provided as a benefit of membership if the officials are members of British Rowing. The use of licenced umpires is encouraged. 2. It is likely that the club will need to borrow equipment from individual affiliated clubs as the United Hospitals does not currently own any rowing equipment directly. It is reasonable for the club to assume that the individual affiliated clubs will provide equipment in line with current British Rowing safety guidelines although the club needs to actively ascertain this. 3. It is almost certain that any individual selected to represent the United Hospitals will already be a member of an affiliated club as this is the prerequisite for representing the United Hospitals. It is therefore reasonable to assume that the individual will be aware of the basic safety issues relevant to the affiliated club (e.g. knowledge of the Tideway Code, requirements for swimming ability, etc) although the club will need to actively check this for each individual. 4. It is almost certain that any individual selected to represent the United Hospitals will be a member of British Rowing which provides for a level of personal insurance cover including third party insurance. The club will identify a lead for the selection process who will be co-opted as a non-voting member to the club committee under rule 5G for the remainder of the academic year. 1. There may need to be preliminary training outings and assessment. 2. These will occur using equipment owned and insured by one of the affiliated clubs (boats, blades, lifejackets, launches). 3. The status of these preliminary training outings (subject to agreement on the part of the affiliated club) is that the training is run by the affiliated club (so that the crew members are either ordinary members or honorary members of that affiliated club). 4. Any third party claim should be referred to the affiliated club. 5. The training will occur in accordance with the rules of the affiliated club. 1. 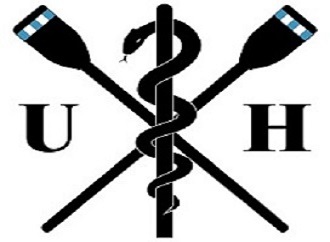 The United Hospitals Boat Club formally takes responsibility for the crew(s) and the equipment that the crew(s) use. 2. The club needs to establish a formal agreement to borrow relevant equipment from the affiliated club(s). 3. The club needs to ensure that there is adequate insurance against third party claims in place. 4. The lead for the selection process is in charge of the day-to-day organisation of the crew training and entry into competition. 5. The lead for the selection process is responsible to the club committee to ensure safety and welfare of the crew(s) and ensure that the safety of all other river users is maintained in accordance with the Code of Practice for Navigation on the Tideway or any guidance for other locations. The committee should be informed of any significant incidents or other issues as soon as is reasonably possible. 6. The lead for the selection process is responsible for ensuring that any local safety requirements (such as those of the University of London Boathouse, any other relevant boathouse or any competition) are met. 7. The lead for the selection process is responsible for ensuring that there is suitable documentation of training outings with notification of appropriate details to the club captains. 8. The lead for the selection process is responsible for ensuring that individuals selected to represent the club have satisfied the basic membership requirements of their own affiliated club (including an assessment of swimming competence and familiarisation with the Code of Practice for Navigation on the Tideway). If the wind direction is S – SW with an ebb stream then the course may be relatively sheltered. Decision may need to be made on race day following change of tide. Care with high wind speeds from cross or tail direction (S or SE) on the flood stream at the finish. If the wind direction is S – SW with an ebb stream then the course may be relatively sheltered even with gusts of > 35mph. No inexperienced coxes will be used. No inexperienced crew members will be used. No crew will be on the water after dusk. Lights will be used in poor visibility conditions. The lead for selection is responsible for ensuring that coxes are competent. Impact on safety of crew minimal. The lead for selection is responsible for ensuring that borrowed equipment meets British Rowing Row-Safe standards. Presence of launch during training. Rowers will need to satisfy individual clubs regarding competence to swim; if not competent then they must wear an appropriate buoyancy aid or lifejacket. The lead for selection is responsible for ensuring that all crew members have satisfied the requirements for swimming competence. Lead for selection responsible for checking current status of PLA ‘flag’ immediately prior to training outings. If ‘red’ flag then no oared boats should be allowed on the Tideway during the ebb; rowing may be possible during the time between low and high water but the stream speed may still be high. Experienced crews may only boat in the flood period provided there is a direct assessment of conditions immediately prior to the outing. If ‘amber’ flag then only experienced crews may boat on the ebb provided that there is a direct assessment of conditions immediately prior to such racing. Lead for selection responsible for reviewing weather forecasts prior to training outings and identifying the risk of adverse weather conditions. No crew should boat from the University of London Boathouse if the full width of the railway bridge is not easily visible. No crew will be on the water after dusk or before dawn. If gusts are forecast >30mph in a direction parallel to the river and against the stream then there is a high likelihood of unrowable conditions especially near high water. However the Mortlake reach is relatively sheltered from the prevailing southwest wind direction, especially in the area of University of London Boathouse and it may not be possible to accurately predict the impact of high wind speed on the water conditions away from the Mortlake reach. If there is doubt then the lead for selection is responsible suspending boating until further information is available. Heavy rain or other climatic conditions may temporarily reduce visibility and the lead for selection is responsible for monitoring the situation. It is the responsibility of the cox to access and understand the rules and byelaws pertaining to each competition. Highways agency and other relevant authority requirements are met. Driver has appropriate driving licence for trailer and load. Lead for Selection responsible for ensuring that trailer and towing vehicle are adequate for the load and that the load is securely fastened to the trailer. Lead for selection responsible for ensuring that the driver is appropriately experienced and licenced for the trailer/load combination. If the club is utilising space on a trailer provided by a third party then the third party is responsible for the adequacy of the trailer and the towing vehicle/driver but the club is responsible for ensuring that the load is correctly fastened to the trailer.